VIEW FROM THE HILL: Once again, raging energy and climate wars are burning out of control in government ranks. Scott Morrison’s government is struggling with a fresh crisis, the combination of a bitter domestic within the Nationals and the conflicting imperatives of pitching to voters in Australia’s north and south on the highly charged issues of energy and climate change. Former deputy prime minister Barnaby Joyce on Monday turbocharged his push to regain the Nationals leadership with a media blitz. Obviously the former Nationals leader would like his positions back now (despite saying “we’ve got to go to the polls with the team we’ve got”) but if that’s not possible he’s staking his claim for after the election. There was a manic edge to Joyce’s Monday interviews, focused on leadership and championing coal. Explaining why, while he wouldn’t move for a spill, he’d feel no “guilt” about standing if the opportunity came, he described himself as the “elected deputy prime minister of Australia”. That claim was based on occupying the position when the Coalition won the election. Bizarrely, he also questioned that emissions could be measured. “It is a self-assessment process by the major emitters … And then it’s compiled by the government. So basically, it’s a proposition about a supposition,” he said on the ABC. Although these days he sounds more over-the-top than ever, Joyce resonates with Queensland Nationals fearing a loss of seats – they have boundless faith in his campaigning power, and are highly critical of the ineffectiveness of party leader Michael McCormack. One of their key KPIs for McCormack has been that he must successfully pressure Morrison for the government to underwrite coal-fired generation. But McCormack hasn’t been able to deliver, and that became obvious on Monday, when Morrison indicated the government won’t be nominating a Queensland coal project for underwriting. “For such a project to proceed, it would require the approval of the Queensland state government,” the Prime Minister said. “Now, the Queensland state government has no intention of approving any such projects at all. So I tend to work in the area of the practical, the things that actually can happen”. Annastacia Palaszczuk might derive some wry amusement to find the PM sheltering behind her skirts. The Queensland rebels are less amused, seeing this as evidence that McCormack has lost the battle (if he ever joined it) and worrying the Prime Minister is “cutting Queensland adrift to sandbag Victoria”. Morrison certainly knows that to embrace a coal project would be counterproductive for the Liberals in Victoria, where a number of seats are at risk. But it is not just Victoria, or even just Liberal seats. A hard-fought state election is underway in NSW, and the Nationals have much at stake. They have several seats on or near the north coast where concern about climate change would top commitment to coal. Lismore is a case in point, where the Nationals have their member retiring, and polling is showing a strong Green vote. The regional vote is seen as crucial to the NSW election outcome, and it is very volatile. The destabilisation in the federal party is the last thing the NSW Nationals need right now. If the state Nationals do badly on March 23, there will be recriminations and that will flow back into the federal backbiting and panic. How McCormack will go managing his rebellious party in the coming weeks is problematic. 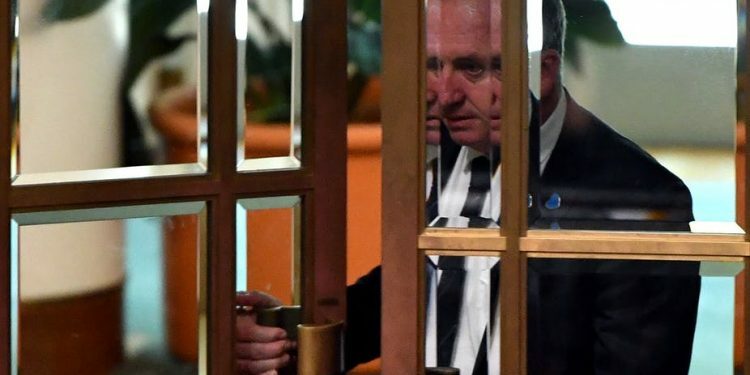 He displays poor judgement under pressure, as he did on Monday, after Joyce said the Nationals could pursue policies in their own right because “we are not married to the Liberal Party”. The man who lacks “cut through” had cut through, in an unfortunate way, to Joyce’s marital failure. On Monday night, the row over coal took a new turn, threatening a dangerous further escalation. A batch of moderate Liberals, in a co-ordinated effort, waded into the debate, with public comments opposing taxpayer funds being used to build or pay for any new coal-fired power station. They included Trevor Evans, Jason Falinski, Tim Wilson (who likes to call himself “modern” rather than “moderate”), Trent Zimmerman, Jane Hume – and Dave Sharma, the candidate for Wentworth. Their comments were made under the cover of supporting the Prime Minister, but they had been wanting to say their piece for quite a while. Once again, raging energy and climate wars are burning out of control in government ranks.